Today’s play-of-the-day is March opposite fun. Learning opposites isn’t a black and white challenge, it’s really quite complicated. Opposites aren’t only one thing or the other, like on-off or black-white. They often depend on the context. For instance, the temperature outside can feel too warm if you are wearing a parka, hat, snow pants, and mittens or too cold, if only wearing flip-flops and a swimsuit. The temperature hasn’t changed but how we describe it will be based on how it affects us. The relationship of objects also influences opposites. A preschooler is small compared to a teenager, but big beside the new baby. There was a Duke of York, he had ten thousand men. For the word UP, kids stand as tall as they can and for DOWN, they crouch way down near the floor. For HALF-WAY , just scrunch down a little. Some kids will be able to pop up and down and sing at the same time but some will only sing or do the actions. A quick opposite game is STOP-GO. 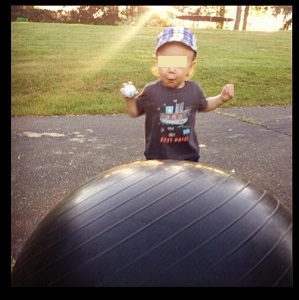 At the word GO kids can run, hop, wiggle, bounce or whatever there is room to do. When you, or another child being the leader, says STOP all the others must freeze and be as still as they can be. Kids can play this opposite game inside or outside. 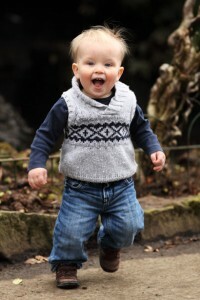 Where appropriate in the day, can you and your child have some March opposite fun? The calendar says March, but the weather may have a different idea: is it like a lion or a lamb? Here are some children’s books for learning opposites. 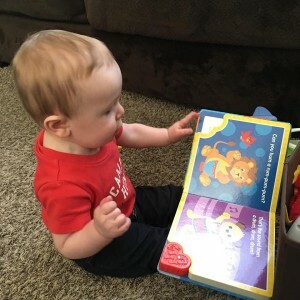 There’s a lion in this book and a little lamb reading it. Or could that be a dear? 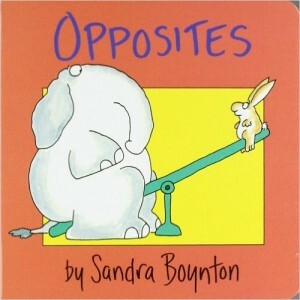 A favorite book that some parents and caregivers might remember is Opposites by Sandra Boynton. This story has wonderful illustrations of animals that show each pair of words. The funniest two are right and wrong. One pig talks on the phone and another wears it on his head. The text rhymes to add to the fun. 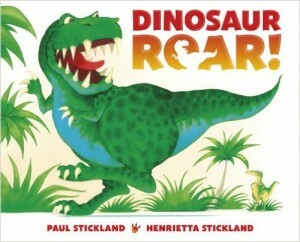 Paul and Henrietta Strickland’s book, Dinosaur Roar is another great choice. The dinosaur pictures are amazing, with vivid colors and details. Wait until you see the size of the dino teeth. The clean/slimy dinosaurs and the spiky/lumpy ones are very unusual choices for opposites. The end of the story uses some opposites describing different ways for dinosaurs to eat. Careful you’re not lunch. 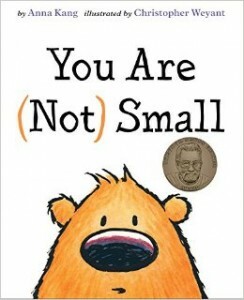 The book You are (Not) Small, written by Anna Kang shows one of the tricky parts about opposites. Things are not just one thing or the other. Opposites exist in relationship. Sometimes things that are big can seem small if something bigger comes along. Small things can be big if there’s something tiny that appears. This is one aspect about opposites that we forget but can be very confusing for kids. 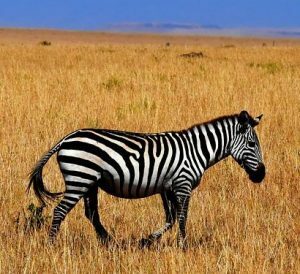 In order to understand how items can be both opposites, children will need lots of experiences with opposites. Have you and your child shared The Very Hungry Caterpillar book? 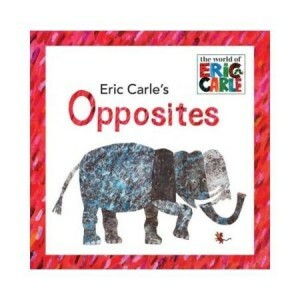 Eric Carle has another book called Opposites. Done in same style of illustrations, this book has an added feature with pages to lift up. Kids can guess what the opposite in a pair might be and lift the page to check. The words in this book are more common pairs. Besides a book about opposites, you and your child may have an opportunity to explore some others. Are there any opposites that come to play at your house? Learning about opposites is quite complicated for young children and needs lots of experiences; soccer can help. The excitement and involvement can help kids with opposites as they watch and play. Some soccer opposites are up-down, in-out, win-lose, happy-sad, big-little, close-far, fast-slow, and these are only a few. Opposites: big-little…photo courtesy of Patrick B. In a soccer game, most of the time players are up, but sometimes they fall down. The soccer ball is usually down on the ground but sometimes it’s up in the air. Up-down are fairly easy to figure out, but other pairs, such as fast-slow are much more difficult. Even though the players are running back and forth across the field, grownups might say that a game is slow. The soccer ball is pretty little but when it goes in the net, it could be a big score. No wonder learning opposites can be challenging. Opposites are not easy to get right, but they are an important language and thinking skill. Some of them are easy to learn, like still and moving, and some are much harder. Opposites are not just all of one thing or all of another, it often depends on what objects are being compared. Is a running player slow or is it just that the ball is really fast? Kids need to compare two ideas or things in relation to each other. This takes considerable thinking. Lots of opportunities and a variety of experiences will help. For a play-of-the-day, whatever your child is doing, take advantage of any possibilities to use some opposites. Still and moving are not a possibility; kids are rarely still, but your child might be building a tower with blocks. It goes up and up and up and then falls down. Toys are a variety of sizes. Are some big and some small? And if you are watching soccer, is the ball going in the net? What other opposites are in play?